I've put away my beads and my gadgetmatics and this will definitely be my last upload for the weekend. Simple, round smokey pink sandstones and colour enhanced agates. I've mixed the two different sets of beads and am thrilled by the end result. The simplicity of the triple strand necklace is given an elegant boost with the addition of a gorgeous triple strand serpentine fastener. I've embellished the one end of the necklace with 2 crystal studded butterflies. 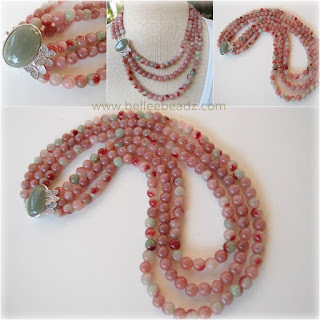 Longest length of necklace - 21"